Editor's note: The following is a roundup of stories related to policing and the Black Lives Matter movement. Police and protesters clashed last night in Charlotte after Keith Lamont Scott, a 43-year-old African-American man, was shot and killed by a police officer. Lamont's death followed a shooting last week in Tulsa, Oklahoma, where another African-American man, Terrence Crutcher, 40, was also killed by a police officer. Police brutality, and the response of groups such as Black Lives Matter, have drawn renewed national attention to issues of race and policing in America. Here are highlights of The Conversation's coverage of these issues. "Children can be impacted by traumatic events if they identify with the victim regardless of geography. Think of how youth of color everywhere may identify with these events, based on the ages and races of the victims... we need to protect our children from being the indirect victims of these events as well." 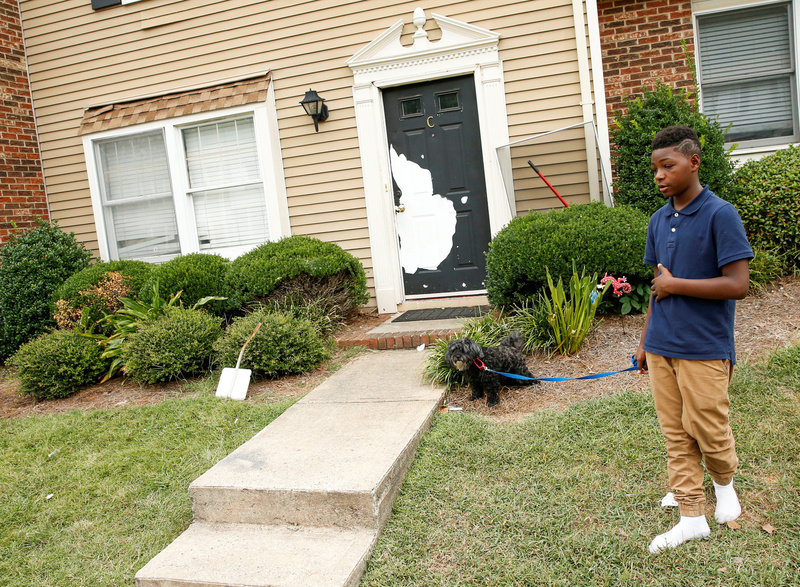 A young boy walks past the apartment where Keith Scott lived the morning after protests. "We know from the stories of black mothers who have lost their children to state violence that the lingering anguish of living in the aftermath of police violence kills black women gradually. Depression, suicide, PTSD, heart attacks, strokes and other debilitating mental and physical illnesses are just some of the diseases black women develop as they try to put their lives back together after they lose a child." Nor are police immune from the effects of violence. A study by John Violanti of the University of Buffalo, State University of New York found that police have a 69 percent greater risk of committing suicide than other working populations. "The top five most stressful events that police reported were, in this order: exposure to battered or dead children, killing someone in the line of duty, fellow officer killed in the line of duty, situations requiring the use of force and physical attack on one's person." Those seeking solutions have scrutinized police departments for their training, practices and culture. Addressing the masculine, aggressive disposition promoted in many departments may be key to reducing police violence, according to research from Frank Roody Cooper, a professor of law at Suffolk University. "An awareness of the way cop macho leads to "contempt of cop" punishments will not prevent all police uses of force. Training machismo out of police officers' habits would be worth the effort, though, because it would allow the deescalation of many potential police-civilian conflicts." "The issue at stake, then, is how to take this opening and not only begin to secure justice for the lives lost to police violence, but also to expand on questions about what it means to value black life."